A team of mechanical engineering students from UCL, backed by UCL Business sponsorship, and led by senior lecturer Dr Kevin Drake and technician Neil Collings, has created a Class One entry in the Formula Student motor sport competition. Building on the success of last year’s Class One and a previous year’s Class Two entry, this year’s effort was more ambitious than ever. A fully fitted-out car, the vehicle was assessed for design, presentation, cost analysis, sprint and endurance. In addition, teams were only permitted to drive their car on the circuit when the vehicle had passed a tough ‘scrutineering’ stage and been judged safe. Dr Kevin Drake said, “The UCL car passed static tests and scrutineering, and managed to complete the sprint and participate in the endurance dynamic events”. He went on to add, “To get that far is a considerable achievement, as the attrition rate was very high. 21 entries failed to complete any of the dynamic events, and as for the endurance event, only 23 out of 69 qualifying teams managed to complete the 24km course”. The UCL car features a Honda CBR 600 motorcycle engine and is driven by a chain. The team swapped the carburettor for a fuel injection system, optimised through testing and controlled by an on-board engine control unit. The tubular space frame chassis meets stringent safety requirements and is clad in smooth bodywork panels, which feature the UCL and UCLB logos. With about 80bhp, the vehicle can reach speeds of about 80mph, but its key strengths are acceleration and manoeuvrability. 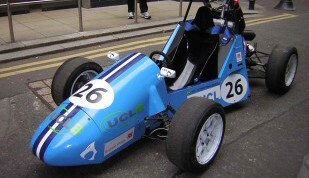 The UCL team was the smallest to compete at Formula Student, with just seven people present. One team had a mobile workshop on an articulated truck and a team coach. The educational experience was key for UCL students, as a small team, each member was able to gain a great deal from the event. UCL’s entry emerged from a collaborative project that formed part of the integral course requirements for fourth-year MEng students and also stood out because it was part-course-based, part-extracurricular, most other teams being solely extracurricular. UCL Mechanical Engineering sees Formula Student as an opportunity to complement its participation in the London Engineering project, a pilot programme to encourage under-represented groups, such as women and ethnic minorities, to get involved in engineering. UCL, South Bank and Sussex are the three universities involved in these early stages, but it is hoped that the project will roll out nationally in the near future. Formula Student began life in the USA, where a competition was set up by the Society for Automotive Engineers. It came to Europe in 1998 and is now a multinational event. Teams from universities across Europe, North America and even India competed at this year’s competition. In the UK, the event is managed by the Institution of Mechanical Engineering. For further information contact Anna Clark, Director of Business Partnerships, a.clark@uclb.com.